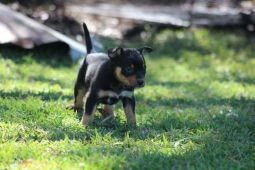 Kelpie (Australian) breeders links and breed information on pups4sale.com.au. 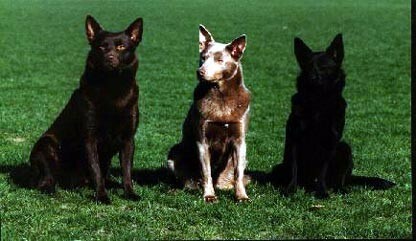 Not a lot is known about where the Australian Kelpie came from, but everyone agrees that these great dogs were bred in the 1800s for herding. They may have come from the crossing of collies and sheepdogs, but there is also a chance that the Australian Dingo was involved in the initial breeding of the Keplie. 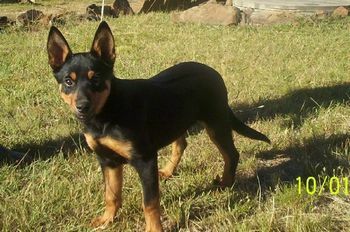 The Australian Kelpie is a medium-sized dog that is considered one of the best one of the world's best herding breeds. On top of their herding abilities, they can also be great family pets when they are paired with owners that know how to work with intelligent breeds. Kelpies aren't large dogs, but they more than maker up for their smaller frame with strong limbs and a broad chest. 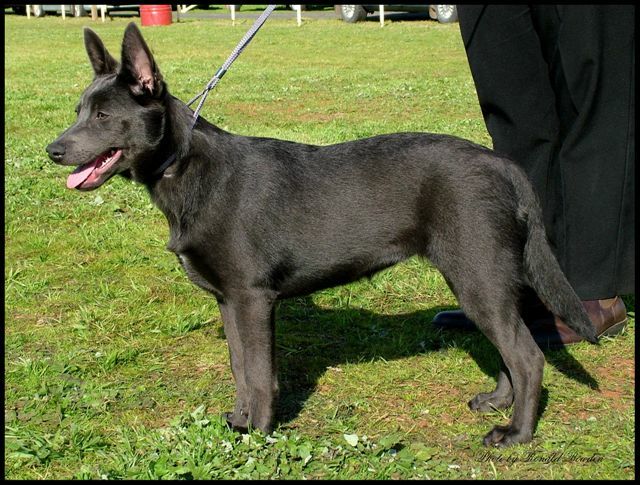 They are very athletic looking dogs and their natural alertness is shown in their pricked up ears. Both male and female Kelpies can grow to be about 20 inches tall and can weigh anywhere from 25 to 45 pounds. The Kelpie has a smooth, strong coat that is weather resistant so they can work in just about any conditions. The most common coat colors are black and tan, fawn and tan, and black. 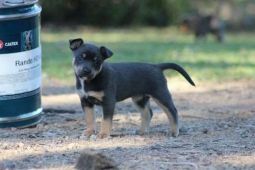 Thanks to Wingdari Australian Kelpie Stud for the pictures of Australian Kelpie puppies & adults used on this page, and the additional information provided. When Kelpies are working, they are calm and know how to get the job done. However, they have very high energy levels, so they need to be exercised regularly in order to keep them happy. They are very intelligent, so this works both to the owner's benefit and it can work against them if they don't treat this breed the right way. A herding move that is unique to Kelpies is the way that they jump on the backs of sheep to keep them moving and to get to the end of the flock. This, and many other herding skills, is why they are considered by many to be the best herding dogs in existence. 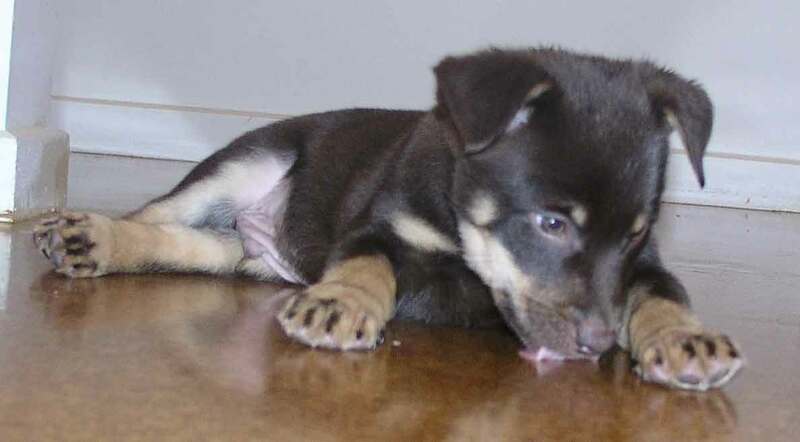 Australian Kelpie puppies develop their loyalties quickly, which is why it is recommended that owners get them as young as possible so they can develop relationships with the entire family. While they aren't the easiest breed to train, they are much easier to train when they have spent their younger years with the same owners. Kelpies are generally great with children as long as they are taught early on that they are a part of the family rather than things they need to herd. Because they have a ton of energy, Kelpies and the children they live with need to learn to control themselves around each other to avoid accidents. Kelpies are okay with other dogs if they were raised with them, but they are known for attempting to herd foreign dogs and cats. This is tough instinct to train out of a Kelpie because most owners will want them to continue to develop their herding skills throughout their lives. While Australian Kelpies are not aggressive dogs, they are still considered to be great guard dogs because they are deeply loyal to their owners. They are smart enough to let intruders know that they are there with their bark, but they will attack if they think their owners are in danger. As long as a Kelpie gets all of the daily exercise that it needs, it is okay to leave them alone in the house for a few hours at a time. However, if they don't get their exercise, they can quickly become depressed without their owners around and, like other dogs, can trash a house in no time. Smarter dogs like the Kelpie are always tougher to train because they believe that they are the boss when they are younger. This is why it takes an owner who is patient and willing to take the time to get through to their Kelpie that they are in charge. Once a Kelpie knows who the boss is, they can can be quick learners. 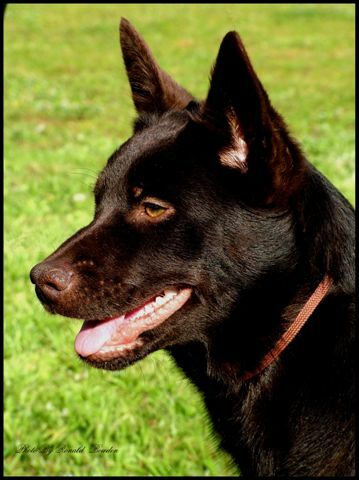 As long as an Australian Kelpie's owner keeps him or her focused, they will have no problem learning simple commands. They may be a bit stubborn at first, but Kelpies love to please their owners and respond quickly when they are told that they are doing something wrong and when they are praised for doing something the right way. The working Kelpie learns to herd fairly quickly because it is in their nature to take charge and herd other animals. Owners who plan on having a working Kelpie should make sure that their dog has completed basic obedience training before they start their herding training. Most Keplie owners find that teaching a Kelpie to herd takes no time at all once they understand basic commands. The Australian Kelpie needs more exercise than most other breeds in the world. This is why it is recommended that owners are active people who enjoy running around with their dogs and spending time outside. 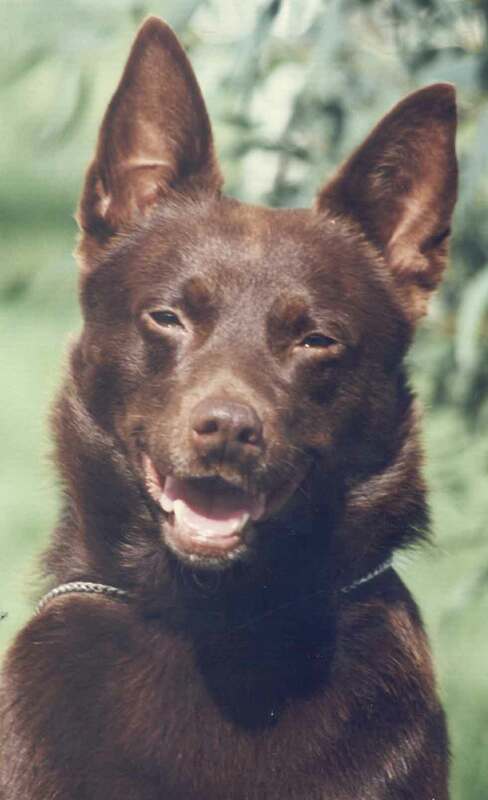 A Kelpie can literally run around until his or her legs are completely tired, so they need people who can both establish dominance with the animal and allow it to use its legs to do work. Not only will a Kelpie become out of shape if it doesn't get regular exercise, it will also get depressed and may take its frustrations out on furniture and other things in the house. No matter how old or young an Australian Kelpie is, it needs to walked, jogged, and run on a regular basis. While the Kelpie may be have specific needs in other areas, grooming is one thing that is easy on owners of this breed. They only need to be brushed every once in a while and they will only need a bath when they are absolutely filthy. Most vets recommend that Kelpies get a bath about once a month because their coats will get dried out if they are bathed more frequently. It is better to let its double coat keeps its oils, which are water resistant, rather than trying to make them smell and look better. As far as ear cleaning and nail trimming goes, the Kelpie will generally have cleaner ears than other dogs because they are pricked up and they will keep their nails filed down if they get regular exercise. When Kelpies get regular love and exercise throughout their lives, they are known to have very few health problems until they reach old age. Cerebellar abiotrophy, a neurological disease, is the only health issue that that is more common with Kelpies than most other breeds. Other than that, they can develop other common issues in later life, such as hip dysplasia. In general, Australian Kelpies live to be between 11 and 14-years old. 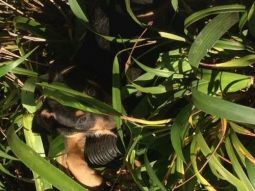 Most dog lovers agree that the Kelpie is a great breed, but they do have specific needs that potential owners should think about before getting one. Owners don't have to use a Kelpie as a working dog, but they need to find a way to make the dog work in other ways. It isn't totally necessary that a Kelpie owner has experience training dogs, but it is important that they take the time to learn how to work with this breed. Anyone who learns how to establish dominance with a dog while not being aggressive should have an easy time with a Kelpie. Kelpies are highly energetic dogs, so someone who has a lot of space both inside and outside of their homes are ideal for this breed. Even when they get plenty of exercise, they usually still have plenty left in the tank, so the bigger the living space, the better. Of course, the most important thing is that a Kelpie's owner has time to spend training it and running around with it. The more energetic the owner is, the happier the Kelpie will be. It would be great if a Kelpie could live in any home and be happy, but the fact is that this breed just cannot live a complete life in a small home or apartment. A big backyard isn't 100% necessary, but it's better for them to have a lot of space rather than just a little bit of grass and a patio. Other than having a large living space, if the owner doesn't have a lot of time to spend at home training and running around with a Kelpie, then it's probably not a good fit. Not only will this breed become uncomfortable when they can't use their energy, they will also attempt to herd kids and other animals if they aren't properly trained. 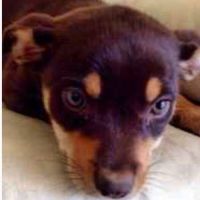 Many people will want a Kelpie because of their intelligence and energy, but they really do need a specific kind of owner to be able to live full lives. While Australian Kelpies aren't the best looking or biggest dogs in the world, they more than make up for it in loyalty, intelligence and natural strength. They are one of the few breeds that can be considered both great family pets and great work dogs.